Movim - Decentralized social platform. Contribute to movim/movim development by creating an account on GitHub. As you may have noticed, the 0.14 #release of #Movim is not there yet. We just found out that Movim had serious issues running with #PHP 7.3 RC2, this seems to be caused by some bugs regarding the #sockets management in this new PHP version. We are currently investigating that and hope that it will be fixed for the final PHP 7.3 release. Update: The issue seems to come from a bug between php-zmq and PHP 7.3, there is some work in progress to fix the issue, more info there mkoppanen/php-zmq - Fix for PHP 7.3. I suggest tat now you are fiddling with the socket code anyway, then please look into that thing with allowing using Unix sockets instead of TCP (you might remember that from MiniDebconf in Hamburg). That would ease things in Debian a lot. Movim 0.12.1 is a minor #release that follows Movim 0.12 – Lovejoy released a few weeks ago. It mostly includes bug fixes and code #cleanup but also comes with a #redesign of the Community page. In parallel some work has already been done for the upcoming version, 0.13. All the internal inter-process communications (IPC) will soon be handled by the ZeroMQ library to fluidify the handling of thoses messages and make the UI more snappy. With #Lovejoy, #Movim is now #easier than before. Let's discover all the new #features bundled in this awesome #release. 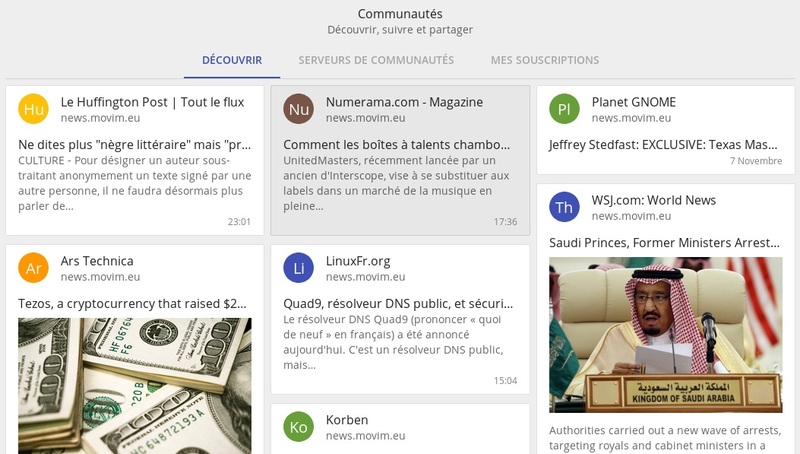 The Movim Contacts page has been entirely redesigned. It now gives you a direct access to your friend's publications and general information. The sidebar also allows you to discover more new publications and nice people. The Community page, introduced in the 0.11 version, has also been reorganized and now allows you to see what is happening on your #pod at a glance. You want to quickly send a picture to your friends? Share a feeling or a thought? The new Quick Publish widget allows you to do that easily. If you still want to do more advanced publications with formatting, you can press the plus button to access a full featured editor. Movim also automatically saves the draft of your publications so you can get back to your publication later. Tagging articles in Movim has been greatly simplified. By simply putting #hashtags you can categorize your publications. Now you can also explore public articles having similar tags. To protect the children browsing the articles we also added an automatic filter on adult content (enabled by default). When publishing "Not Safe For Work" content you can categorize the articles as so by adding the NSFW tag to it. If you want to have access to those content, you can enable them in the configuration. Lovejoy also comes with a new design for the articles cards. The embedded links are better integrated and you can now directly like an article while browsing! The redesign also simplifies the browsing and navigation on mobile devices. The UI of Movim has been redesigned for mobile devices. A new menu allows you to quickly switch between the four main pages. You can access the full menu by dragging the left side of your phone to the right. A lot of love has been put in the chatroom features of Movim. They now have the same look and feel as the single chat ones. You can also now embed pictures in the discussions by uploading them or pasting links directly and you can auto-complete the nicknames by pressing Tab when writing a message in the chatrooms. Since Lovejoy you can start a private discussion with a chatroom member in one click and invite your contacts to join the chat-room by sending them a message, or an invite link. Thanks to the new autojoin feature, you can ask Movim to automatically join some of your favorite chatrooms when you log in. Movim now implements the recent XMPP standard called Chat Markers, this allows you to know if a contact has seen your messages. This feature is also fully compatible with clients like Conversations or Dino. Say hello to Miho, the new mascot of the Movim project. A new sticker pack created by Hey-Xander is available on Movim. With the support of the XMPP standard Message Archive Management you can now resynchronize your history when logging back to Movim, for your private discussions but also in the chatrooms. Never loose any messages anymore between your devices! Under the hood we continue to fix many issues, optimize and refactorize the Movim sourcecode to keep the Core engine clean and secure. This is also made possible by a continuous feedback from our community, via our official chat-room and our Github Page. As members of our community become more and more involved, new pods have been opened in Sweden, Japan, Germany and Russia. Thanks to the maintainers! One of the biggest tasks of those past months has also been to migrate our official server from the deprecated Metronome server to ejabberd. This migration contains more than 11 thousands accounts, thousands of articles, messages and relations. Thanks to the ProcessOne team and especially Christophe Romain, Evgeny Khramtsov and Holger Weiß we greatly improved the script to migrate the data from one server to another and several features used by Movim after the migration. ejabberd is now officially recommended by the Movim team. To make Movim fit perfectly with your server, please follow our ejabberd configuration page on our Wiki. For 9 years now, the Movim team and community is working freely to develop the platform and the related projects. We are also hosting the official pods to allow our users to enjoy Movim daily. To continue to maintain and expand our infrastructure we are looking for your help. You can contribute by doing a one time donation on our Paypal account or on our official Patreon. You can find all the information on our official website. can i integrate my contacts via ldap subscription to movim from my android device? patreon solicits identity confirmation. blech. and signing up under protection of vpn surfing provider halts the process. shame. Is not movim funded by grant? ejabberd 17.09 is the first version of #ejabberd recommended for the upcoming #Movim 0.12 #release. We worked closely with the ProcessOne team, especially on the #Pubsub implementation, to improve the integration between Movim and ejabberd. Thanks to them! ejabberd 17.09 is out! This release mostly contains bugfix and adds few improvements.